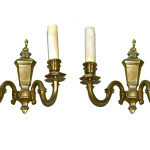 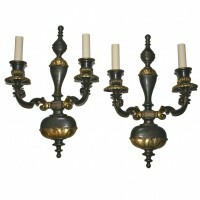 Pair of polished bronze leaf motif Moderne style double light sconces. 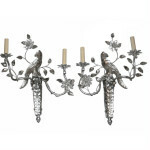 209 E. 59th St. & 238 E. 60th St. 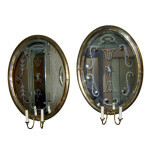 Pair of 1940's French large double-light gilt bronze sconces with etched mirrored backplate Measurements: Height: 33" Depth: 6.25" Width/length: 22.5"